please toggle DST setting (ON or OFF) in Timekeeping mode according to the page of Daylight Saving Time (Summer Time) setting in the operating instruction manual of your watch. You can download the operating instruction manual directly by clicking the module no. in following. If the module no. 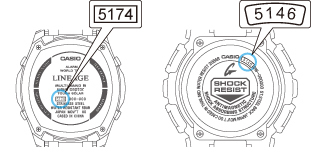 of your watch is not below, please read an operating instruction manual of your watch. You can download it clicking here. Following modules need to adjust the digital time and analog time separately.